The asparagus we sauted and added to a hash (potatoes, asparagus, green onions, and left over sausage). 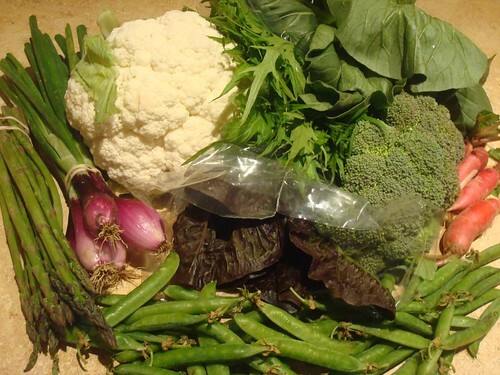 The broccoli, cauliflower, and bok choi were flash frozen to add to our stash. About half of the head of cauliflower was left out for roasting and snacking. Which reminds me, we should do that. Maybe for dinner tonight. I was intending to make mashed turnips with dinner but when I started peeling them the peppery scent clued me into my mistake. What I had thought were turnips were radishes. So instead, the radishes went into a delightful salsa (recipe coming soon). We also used up the head of cabbage from week two by making coleslaw for a friend's bonfire over the Memorial Day weekend. And in case you think that the hubby and I are having all the CSA related fun, look what I found drug upstairs and left in our bedroom. Our fierce hunters brought us a present! 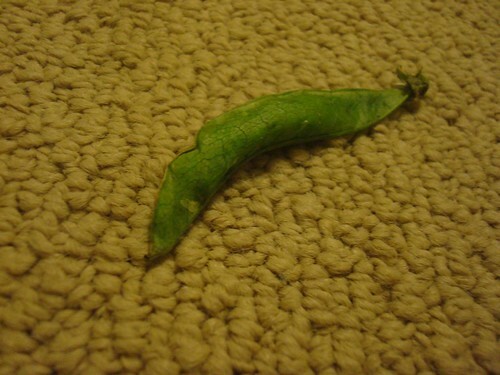 A dead pea! I am SO tempted to sign up for a CSA. Do you find that it's monetarily worth it?